Wineries in Istria are awesome. If I remember them correctly. You know that a visit to the winery typically includes lots of wine-tasting. Wine-tasting could potentially affect my, otherwise good, judgement (you have been warned!). However from what I believe I have experienced on my visits to these wineries in Istria, I put them at the top of my list worth a visit. You got to love Istria! Not only beautiful beaches and sea & sun, it has developed into a prime wine growing region. These are my suggestions where to go to wine tasting and of course – purchase. A week or two in our villas will pass much better when you stock some of the best regional wines! I don’t even know where to start when it comes to Kozlovic winery. Beautiful architecture, friendly staff (thanks, Marko! ), fixed working hours (not always the case, thus we’ve learnt to appreciate this fact), and fabulous wines. Oh, I’ve almost forgot to mention the location! Kozlovic Winery is located close to Momjan, well off the beaten path, surrounded by olive groves, and beautiful landscapes. Combine a visit to the winery with a lunch at Stari podrum restaurant, and you’ll set yourself for a great day. Cuj is one of our favorite winemakers in Istria. He is passionate, hard-working and wine-loving man. Visit to his winery is a great experience, and he and his family will make you feel very welcome and at ease while sharing with you their family’s history of wine-making and viticulture. Cuj also produces four extra virgin olive oils. His property is nice, and consists of an oil mill, wine cellar, and a tasting room with an open fireplace. Bruno Trapan is a rock’n’roll star of wine making in Istria. He’s so cool that we’ve been almost intimidated visiting his winery and meeting him (OK, we’re exaggerating, but we were pleased to meet him). Like we’ve met Mick Jagger for real. Just better :). He belongs to the younger generation of wine makers. He’s charismatic, and fun to be around. Very active on social media, there is almost no wine blogger or wine journalist who comes to Istria and doesn’t visit Trapan Winery in Sisan near Pula. His winery is modern. 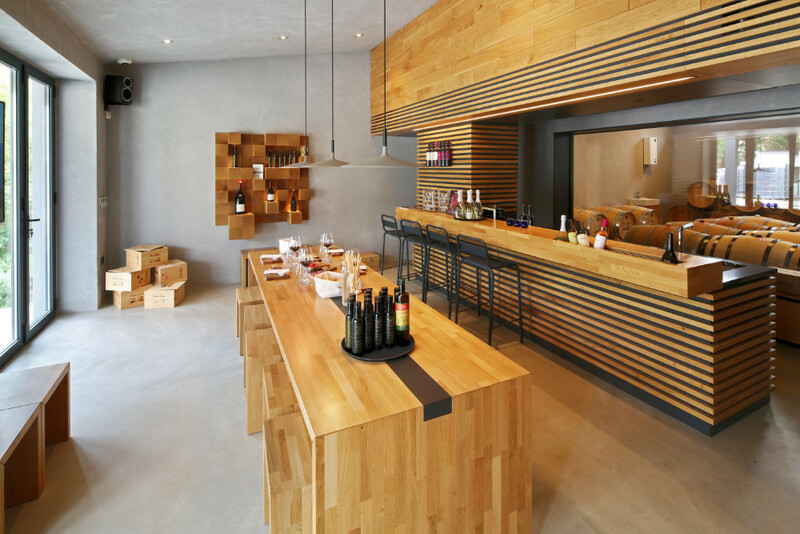 The tasting room, decorated in dark brown wood, features a large tasting table and a nice fireplace. Great winery to visit if you are in Istria. Roxanich is a living proof that the wine can be made in many ways. This guy doesn’t buy a story of young, fresh, and light whites. Instead, his wines are orange, an aged white wines full of character. (Oh, I really love his Ines u bijelom wine). The winery is located in a small village, only 10 minutes drive from Porec (Yay, one of the best and located so close to home!). Since Roxanich takes a different approach, ages his wines, and leaves a must in conntact with skin for up to 180 days, you can have an excellent vertical tasting of the same wine. This is a great way to witness first hand how the wine actually develops through different stages. It is about fresh wines intended for intimate moments, for lunch, dinner or relaxed socializing on the one hand, and on the other, equally intended for professionals who will serve them at wine bars and restaurants. These are quality wines, able to satisfy the demanding wine lovers, as well as those who are just about to enter this world.